The crazy and beloved anime series Neon Genesis Evangelion turns 20 later this year, and Japanese Eva fans are looking to celebrate by literally embedding a teeny replica of a famous weapon from the show into the moon. Beats a birthday cake, I guess! 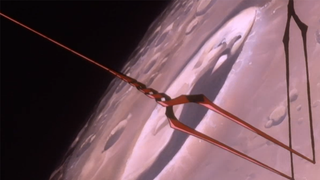 Yes, fans want to replicate a scene in the anime where the Lance is hurled into space, embedding itself into the lunar surface, by launching a specially designed lander to the moon, carrying a 9.5 inch titanium alloy replica of the weapon (it shares a name with the christian relic, the spear used to pierce the side of Jesus Christ following his crucifixion, but in the show it was an immensely powerful weapon that could pierce the shields of the monstrous Angels attacking humanity, or the bio-mech EVAs piloted by the main cast) that would then be released by the lander so it could stick itself in the moon's surface. Fans took to Japanese crowdfunding service ReadyFor to fund the project, which is looking for 100 million Yen (around $850,000) by April 5th. Unsurprisingly, giving the fervour of a fanbase like the one for Evangelion, the project is already over a third of the way there, raking in 34.1 million Yen as of writing. Still, it's a nobler goal to want to pierce the very moon itself with the Lance, rather than, say, a 9-patty hamburger.